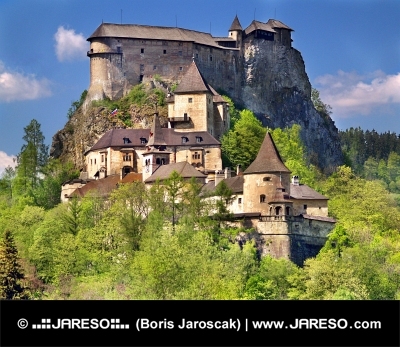 This is the view of the southern side of popular tourist destination known as famous Orava Castle (Slovak: Oravský hrad, German: Arwaburg, Hungarian: Árva vára) during the summer time on a clear blue day with a few clouds in the sky. On this southern side you can see buildings of the Orava Castle known as the Upper castle (Slovak: Horný hrad) and Lower castle (Slovak: Dorný hrad). 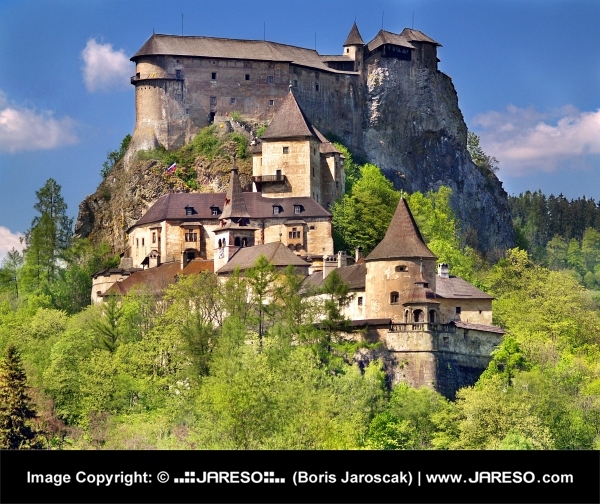 The Orava Castle is colloquially known to have the nickname "The Eagle’s Nest", because of how its highest and oldest part sits on a massive rock formation. This natural formation is known as "castle cliff" which forms steep 112 meters (367 feet) high hill that serves as natural stronghold for the castle where this castle is also partially hidden by green coniferous trees surrounding it. 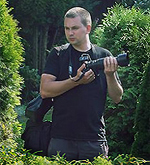 The Orava Castle went through a number of different owners during its time of existence as well as through a lot of renovations and fortifications. Unfortunately at the beginning of the 19th century the Orava Castle burnt down when a gigantic fire destroyed all wooden parts of the castle. However later it was archaeologically preserved and reconstructed so that it could continue to live on. The Orava Castle is clearly seen as one of the most attractive castles located in northern Slovakia. It features number of fortified entry gates, ordered one after another and even a short tunnel, that leads to main courtyard. The castle is opened for those that come to visit and want to tour it. It can get quite spooky there at night and there are often spooky night shows that take place as well as popular theatrical performances, or other exhibitions that are scheduled throughout the year. The Orava Castle is also a popular location for filming fairy tale, or horror movies. Many scenes of the world famous Nosferatu (1922) film were filmed there. It is definitely worth a visit.